As soon as we woke up Sunday morning we could already sense it: the end of the trip is coming, and it’s coming fast. We woke up in St. Louis but by lunchtime we were not in Kentucky, having crossed southern bits of Illinois and Indiana along the way. By nightfall we’d be in Ohio. We had also crossed back into Eastern Time, which put a big, bright exclamation point on our increasing proximity to home. The feeling was inescapable. All we could talk about in the car was the end of the trip: how we couldn’t believe it was already here, how we had only a few more stops, how we’d be home in just two days, how we’d have to go back to more normal behavior and habits, how Sam would have to get used to not being the center of the universe, how we can’t wait to see Abby, what we’ll be doing over the next couple of weeks, and on and on. I was glad that our adventures in Louisville took our minds off the end for a few hours. Louisville Slugger was extremely cool. We got there just in time for a tour of the factory, where we saw five-pound cylinders of ash or maple turn into two-pound, custom-ordered baseball bats right before our eyes. We watched the Louisville Slugger logo being burned right onto the bats, learned how to tell ash bats from maple bats while watching a game on TV, saw unfinished ash bats being hand-dipped into black stain and hung to dry, and got free souvenir minibats. The museum part wasn’t nearly as interesting but it did contain a few gems, including the original stamps for the signatures of every player ever signed to a Louisville Slugger contract from Babe Ruth to Ike Davis. One of the more intriguing names was Go-Go Russel, a minor leaguer from the 1970s who went by that nickname to avoid being treated as the famous child actor he had been; went he later went back to acting he also went back to his first name, Kurt. The other especially fun part of the museum was being able to hold and swing one of Mickey Mantle’s game-used bats (Sam chose to swing David Ortiz’s instead). We also hit the on-site indoor batting cage, where were were able to use bats that were not game used but were made to the specifications of certain Major League players. Well, I was–they were all too heavy for Sam so he used an aluminum model. I did pretty well with a David Wright model: 34 inches long, 31.5 ounces. Across town,we arrived at famed Kentucky Derby racetrack Churchill Downs just in time to take the last tour of the day. It’s exactly as regal as I’d expected and much larger. But the tour (which was “free” with paid admission to the Kentucky Derby Museum) was extremely cursory. It took only about 20 minutes, largely because our tour guide took us to the paddocks (basically the horses’ locker room) and the winner’s circle and nowhere else. Any other part of the grounds he mentioned was merely pointed out from a distance. Still, it was pretty cool to practically stand on the most storied racetrack in America. I don’t know a whole lot about horseracing and Sam knows a lot less than that, but we both still appreciated the history and recognized several of the Derby winners’ names. (OK, I recognized several of the names. Sam knew Secretariat from the recent Disney movie.) Sam was especially amused by the sign that warned, “All ponies must be kept beyond this point,” mostly because we’ve never been anywhere such instructions were necessary. After the lucky timing of our first two stops we struck out at stop #3: by the time we got around to visiting Colonel Harlan Sanders’ grave the cemetery was closed. We did notice and appreciate the KFC that was practically right outside the cemetery gates, though. On the way out of town we made one more quick stop so ridiculous that it made a visit to Colonel Sanders’ grave seem necessary by comparison. Under an overpass for Interstate 64 is a public pay parking lot, outside of which sits a small plaque. The plaque commemorates the origin of the song “Happy Birthday to You, ” which was written in Louisville by two women. Yes, it took two people to write a song that has four words. Why the plaque is in that exact spot I’m not sure, and the plaque itself doesn’t say. 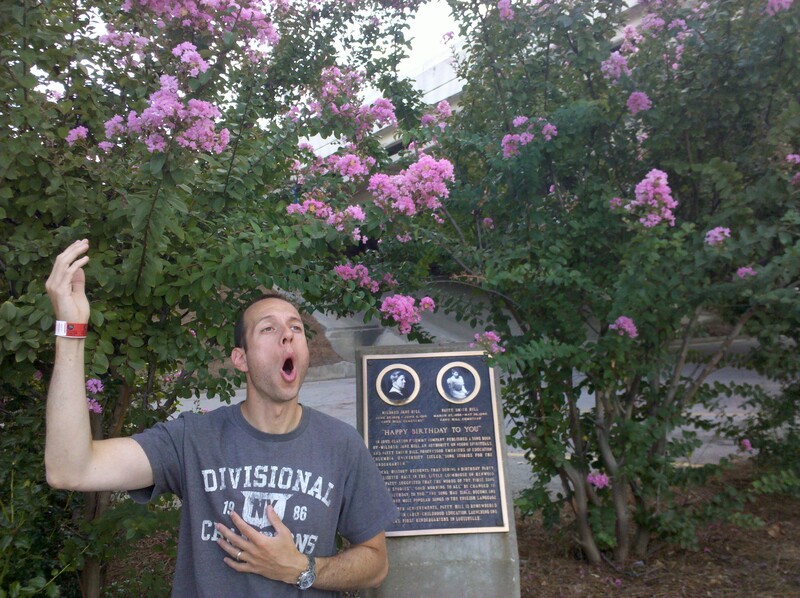 But that didn’t stop me from paying tribute to the 19th-century songwriting duo by singing their classic in front of their plaque. Sam was not amused but I made him take a picture of the event anyway. It was a fun day despite all the talk of the end of the trip. We capped it off by driving an hour and change to Cincinnati, stopping along the way to grill knockwurst for dinner (just to mix it up a little). Tomorrow we’ll spend a few hours exploring Cincinnati and then head to Pittsburgh for one last ballgame before we head home. And we’ll probably spend a lot more time lamenting the inevitable end of this extraordinary journey. We will all be glad to have you back.